Last month, Clinique introduced an innovative new line of nail polish, A Different Nail Enamel for Sensitive Skins, which is currently creating a lot of buzz in the beauty world. However, if your initial reaction is similar to mine, you're probably wondering what effect nail polish could possibly have on the skin since, as we all know, it goes on our nails. Turns out regular nail polish can be a significant allergen for people with sensitive eyes and skin, resulting in itchy, watery eyes (we touch them constantly without even thinking about it) and uncomfortable rashes. It only makes sense that Clinique, a company known for its sensitive skin products, would be behind this dermatologist- and ophthalmologist-approved nail polish formula. The result: A Different Nail Enamel, a line consisting of 12 regular polishes, 9 limited edition shades released for Summer 2013, and a combination base/top coat said to prevent chips for at least seven days. I can't personally comment on the polish's hypoallergenic qualities, but I do think some of the summer colours I received from Clinique and Vervegirl are especially great for pedicures. I opted for Hula Skirt, my personal favourite. Under indoor lighting I initially thought this polish looked a little like OPI Mermaid's Tears but they are not dupes at all. The green is more apparent under natural light and super pretty. I decided add a little extra sparkle by applying a second polish in a diagonal across the bottom half of my big toenails. I used Strappy Sandals, which appears to be the only metallic in the Clinique collection so far. I love the silvery finish and it applies much more smoothly than my similar Butter London Lillibet's Jubilee. I then finished up with a few nail decals from Daiso. The green looks lovely and I love how you added a little bit extra on your big toe. It looks super cute! I really didn't know about nail polish for sensitive skin though. 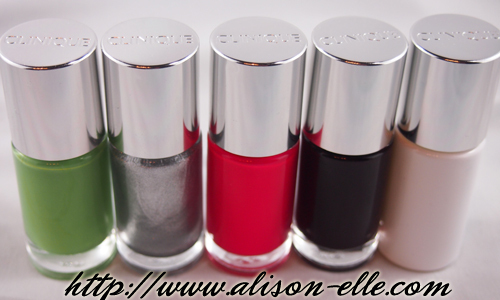 Love the new nail varnish collection from Clinique! I am not sure if it is available in South Africa yet, but will be sure to get my hands on a few of the colours as soon as it launches! I actually didn't know nail polish can trigger allergies , love the pretty colours in this range. I had no idea that nail polish can upset people with sensitive skin, that's so interesting! I love the colour of that polish. the green one you chose is so pretty! Love it! Will check it out! Aww! Very cute pedi! I wear heels so much that I don't think I want people looking at my feet! Feet pictures are kind of weird anyway (or at least that's what I was thinking making this post)... but they really are cute pedi colours!